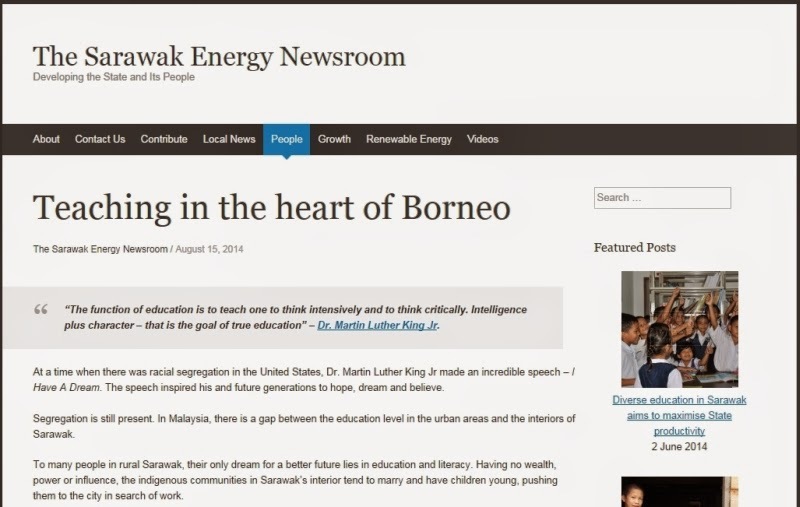 A few months ago, I was approached via email for an interview about my opinions of the importance of education to rural folk in Sarawak. The question pushed enough of my hot-buttons that I answered immediately & elaborately. I wanted to raise awareness about the education challenges & social issues in the part of rural Sarawak I serve in as well as call people to action. I guess my answer was so comprehensive that the news agency used it to publish an article on their site under my name. They also used a lot of pictures of me in it. Especially one big picture of me at the top of the article even before anyone read the text. I didn't like what I saw. I decided not to share the article & I emailed the journalist about my desires & intentions for answering her queries & how the article is might become a disservice to everything that I am trying to achieve in the jungle. I am no politician. I don't need journalists to over-blow my persona. This is not something I want at all. I want the focus to be on THE ISSUE. NOT on me. I'm hungry for change. I'm not hungry for attention. I became very concerned when people started sharing the article on social media & tagged me in it. I hope that I do not become a Malala. I don't want people to support me in spirit/on social media & then do nothing at all about the issue. I want more people to innovate & come up with their own unique solutions to age old problems in their own world. I want to decrease so that others may increase. Together, in our own little ways, we can do a lot more. Fortunately, the journalist I contacted took down the article, apologised profusely & rewrote the article. This new one is way better. Although my name is mentioned multiple times & most of the words used were mine, my picture does not appear in it & another teacher is also quoted in the article. Do read the article & comment on it. If you would like to clink brains with me & flew your muscles to help, send me an email or contact me on my FB page.